Laboratory Fellows Dr. Julia Laskin, Dr. Grant Johnson, and Dr. Venkateshkumar "Venky" Prabhakaran (pictured left to right) at Pacific Northwest National Laboratory provided an invited feature article describing their work on ion soft landing for catalysis and energy storage. Enlarge Image. 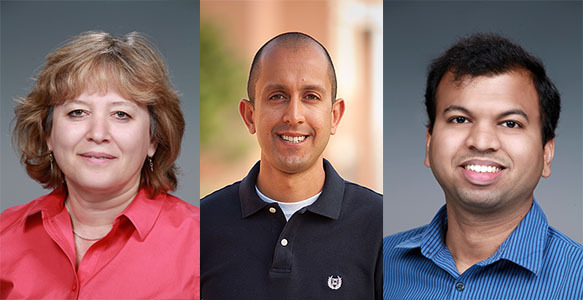 For about 7 years, Laboratory Fellow Dr. Julia Laskin, Dr. Grant Johnson, and Dr. Venkateshkumar "Venky" Prabhakaran have pursued studies focused on understanding how to drive vital reactions, such as those needed for longer lasting batteries. These studies allowed them to design electrodes and other surfaces with never-before-seen functional properties. In recognition of their contributions, the editors of the Journal of Physical Chemistry C asked the scientists to share their perspectives on this burgeoning subject. The feature article offers a broad context and discusses insights of their work for understanding catalysis and energy storage processes on a molecular level. In preparing new electrodes, the challenge is covering surfaces evenly with the right, hard-working active species, either single ions or complex assemblies. To do that, scientists use the technique called ion soft landing to select a particular ion of interest from the mixture of other ionic species in solution and deposit it onto electrodes. As the name implies, complex ions are gently deposited using special mass spectrometry instruments designed by the team. This approach greatly improves production time and performance. For example, through the soft landing process, the team created a precisely defined designer electrode in less than 3 hours. It used to take 24 hours to create a similar electrode using a previous generation of instruments. When working with nanometer-sized ions, miniscule changes to the size and composition can dramatically change their performance. The researchers examined how the ions retain their charges and used this phenomenon to control the spatial distribution of ions and activity of different surfaces. Their recent work led to the design of higher performance electrochemical energy storage devices known as supercapacitors. The work appears in Nature Communications. Being invited to write the feature article gave the team a chance to offer a broader view on their contributions to the scientific community over the last few years. Their previous research as well as ongoing work is made possible by the U.S. Department of Energy's Office of Science, Office of Basic Energy Sciences, Chemical Sciences, Geosciences, and Biosciences Division, and the Laboratory Directed Research and Development Program at Pacific Northwest National Laboratory. Sponsors: The team's ongoing research involving soft landing of mass-selected ions on surfaces is supported by the U.S. Department of Energy, Office of Science, Office of Basic Energy Sciences, Chemical Sciences, Geosciences, and Biosciences Division. G.E.J. acknowledges partial support from the Laboratory Directed Research and Development Program at the Pacific Northwest National Laboratory.